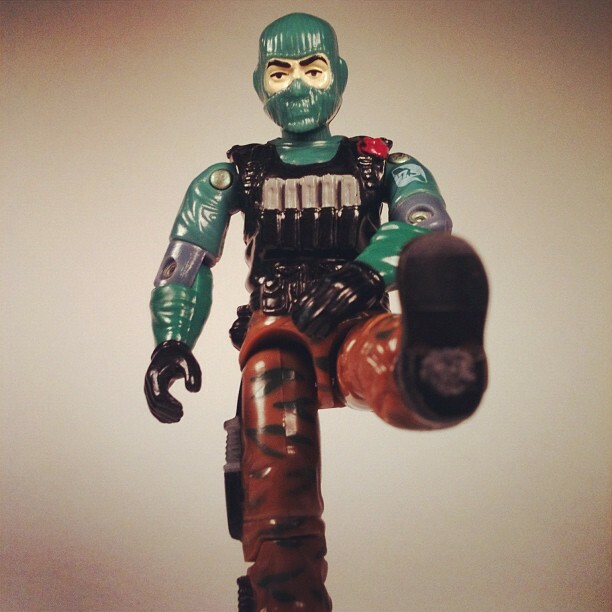 As my collection continues to grow, I began looking at ways to proudly display my Vintage GI Joe’s that I’m so painstakingly refurbishing and restoring to their former 1980’s glory. I began looking at cabinets, shelving systems, and risers to get an idea of how my beloved GI Joe figures were going to be set up. I began a test run by standing a few figures next to each other not unlike a grade school class picture, Yeah – you know the type, and while I was arranging them, Sci-fi’s hose caught the tip of the Vipers rifle and…dominoes. They all fell like dominoes. Next step? get some figure stands. Sounds easy enough right? I began doing some research on message boards to see what fandom was using and it basically came down to two stands. 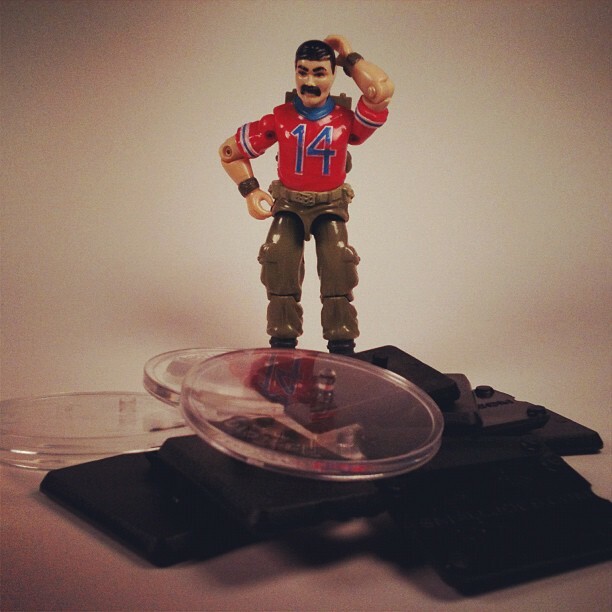 A circular, clear stand by Protech or smaller rectangular stand by smalljoes.com that look (and I assumed modeled) after original vintage stands. I purchased both for comparison’s sake in order to inform you our readers. the result? disappointment and frustration. As far as stability and style goes, Protech comes out on top due in large part to the sheer size and circumference of the stand and the clear plastic gives the stand a classy “glass” look, But as you can see above, the pegs on the base are too large for vintage figure peg holes and thus the figure doesn’t sit flush on the stand- the figure floats 1/4 inch above the stand! I suppose you could get the figure to go down a bit farther by putting force on it, but with the amount of money I’m spending on these figures, why risk breakage? I double checked to see if I hadn’t purchased modern stands by mistake and no, these are meant for vintage figures. These smaller stands fit the figure’s peg hole perfectly! and due to their smaller size, I could fit even more figures on one shelf compared to the larger Protech stand. I thought I was golden! Golden that is, until I went to grab Beachhead for some paintwork. 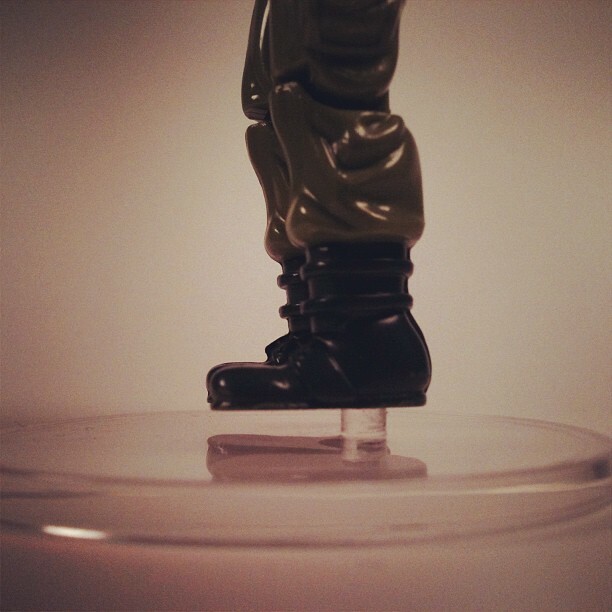 I tried to pry the figure from his stand only to have the peg snap completely off the stand and lodge itself in Beachhead’s heel where it remains until I figure out a safe way to remove it. I didn’t manhandle the stand with bear-like claws either- I simply held the figure by his legs and pulled up with light force.